The Colonel is think­ing out­side the bucket with the new Fam­ily Din­ner Box from KFC. It’s the first time in 50 years, the chain has intro­duced a new family-style package. Get a han­dle on din­ner with KFC Canada. For the first time in more than 50 years, the Colonel is offer­ing an alter­na­tive to KFC’s world famous bucket ¾ a styl­ish, easy-grip din­ner box that serves four. 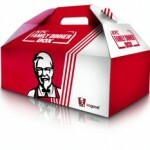 The new KFC Fam­ily Din­ner Box arrives in stores on March 19, 2012 — and caters to the whole family’s taste buds. Now, KFC Canada fans can pick and choose from an array of sig­na­ture sand­wiches and wraps, famous Orig­i­nal Recipe chicken, Mini Breast Fil­lets and an assort­ment of sides to cre­ate four cus­tomized meals all in one box! 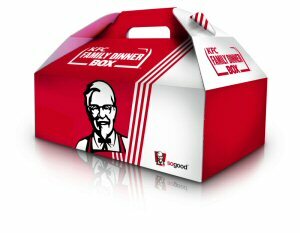 As an added bonus, the KFC Canada Fam­ily Din­ner Box is com­pact, easy to carry, and includes free pop­corn chicken for sharing. 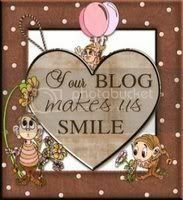 Chose from five main items includ­ing KFC famous sand­wiches, wraps, and Orig­i­nal Recipe® chicken and four clas­sic sides ¾ the din­ner com­bi­na­tions are end­less! Adven­tur­ous flavour seek­ers can savour a hot and spicy KFC Zinger® chicken sand­wich with a side of zesty coleslaw, while purists can enjoy two pieces of Orig­i­nal Recipe® chicken and tra­di­tional fries – and the kids can munch on juicy, ten­der, white meat Mini Breast Fillets. Car­ras­cal says the KFC Fam­ily Din­ner Box is mak­ing its first North Amer­i­can debut in Canada – after block­buster sales and suc­cess in Aus­tralia, where it was recently intro­duced. Cur­rently, KFC Fam­ily Din­ner Box is not avail­able south of the border. While Car­ras­cal expects the new Fam­ily Din­ner Box to become a pop­u­lar menu addi­tion in Canada, she says the iconic bucket is here to stay. 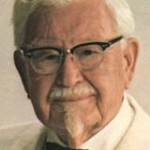 Orig­i­nal Recipe® chicken was first per­fected and intro­duced by KFC founder Colonel Har­land Sanders more than 50 years ago in Corbin, Ken­tucky. The famous 11 herbs and spices recipe remains a secret to this day, hid­den in a high-security, top-secret vault located in Louisville, Kentucky. When it was first intro­duced in 1957, the KFC bucket became an instant pack­ag­ing clas­sic that rev­o­lu­tion­ized take-out din­ing. 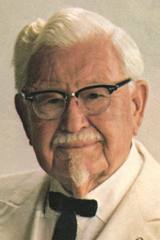 Since then, the trade­mark red and white KFC bucket has been embraced by coun­tries around the world. The new KFC Canada Fam­ily Din­ner Box is avail­able for both take­out and deliv­ery at par­tic­i­pat­ing KFC loca­tions across Canada. 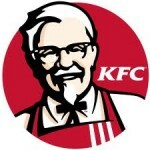 Visit www.kfc.ca to find the KFC near­est you. KFC is Canada’s largest quick ser­vice chicken restau­rant chain with more than 674 KFC restau­rants across Canada. Since KFC opened its first Cana­dian restau­rant in 1956, KFC cooks have been freshly prepar­ing its famous, irre­sistible Orig­i­nal Recipe® chicken every day.